Macy's "Friends and Family" Sale - Which am I? This past Sunday my local Macy's was having their every week, annual, never to be repeated, friends-n-family, spectacular, lowest price of the season, weekly, "One-Day-Sale". I am not sure who they think they are fooling but just for the the record - it goes on for three days, no need to be either friend or family and happens every weekend. I succumb to the hype and had to go. What can I say; I was bored. However, last Sunday was a good sale. I purchase the above two tops and both work especially well with jeans and create a nice look. I think the denim top (almost silky) on the left will be utilized next time I fly. 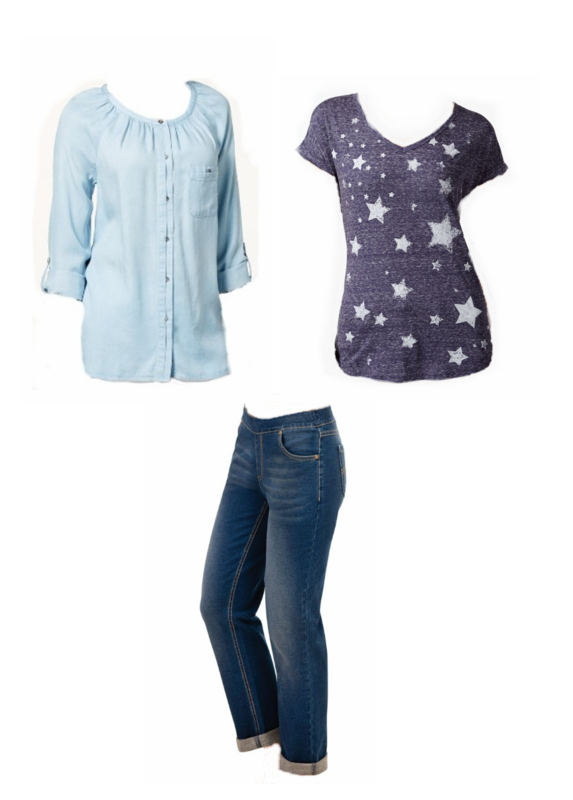 (Texarkana Arkansas and Dallas Texas - Monday, May 16 through Friday, May 20) Both tops are comfortable and somewhat feminine, without screaming girly. The Pull-On style jeans above have become my favorite after seeing them at Susan Street's, Fifty, Not Frumpy blog site. Wow does she have great fashion advice. The Jeans really fit my legs and work wonders for the bottom. Highly recommended! By shopping around you likely can find a length, and color that suits you. The flat front, without buttons, and zipper give a nice smooth appearance with tops that lay over the waist line. One of the feminine differentials I discussed last week. The choosing and wearing of feminine casual clothes have really added a new dimension. After going out only socially and working as a professional for so many years, I was lost putting a casual outfit together - No clue. Mostly because my weekend/casual outfits were many times, not feminine. I am not working as much now, so it is fun to put on something like the above items and go to lunch, the mall or a movie. Within ten minutes I just comb the hair out, put on minimal makeup and I am ready to go. Liberating. Best of all - No one notices. Why, because you just blend in.